The beauty of plantation shutters can unfortunately be accompanied by a lot of hassle during the selection and installation processes. Making sure that you’re using high quality products which are installed properly is key to getting the most out of your plantation shutters. That’s where Jim’s Floor Depot comes in. We offer well-crafted plantation shutters, along with custom installation, to ensure that your window treatments are as beautiful as you’d hoped. Shutters are a fantastic way to control the amount of natural light that comes into your home through the windows. They also afford complete privacy when necessary, or allow for a fantastic view, at degrees that you can customize. 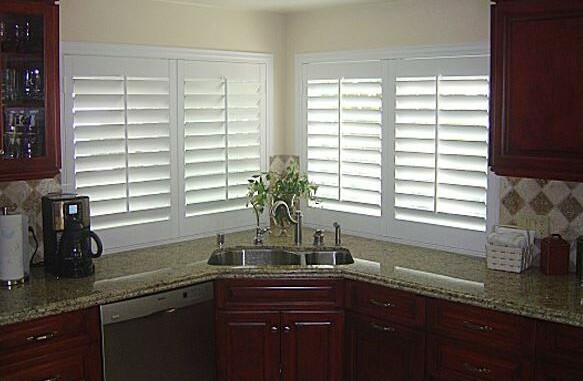 Plantation shutters offer a beautiful, rustic option when choosing the perfect window treatments for your home. Available in both wood and poly (polyvinyl chloride plastic) options, there are a variety of different looks that plantation shutters can bring to your home, in a myriad of colors. While natural wood and white are the most popular options for plantation shutters, poly shutters come in a rainbow of colors, so you can design your home on your terms. We offer a wide-ranging selection on plantation shutters, to make sure that we can provide you with the perfect product to suit your needs. Estimates – To ensure that you purchase the right shutters to fit the size and shape of your window, we offer estimates and advice. Don’t worry about getting home and finding that your shutters won’t fit the window that you wanted them for. Measurements – We hold ourselves to a standard of measurements that are both accurate and precise. We’re committed to ensuring that your shutters fit where they’re supposed to and open and close smoothly. Handiwork – We’ve got the tools, the knowledge and the experience to install your plantation shutters quickly, correctly, and without hassle to you. Clean-up – Even the simplest of installations can come with unintended mess attached. When Jim’s Floor Depot is on the job, clean-up is not your problem. We’ll take care of it so that you don’t have to. Scheduling – With flexible hours and a friendly crew, we can find an installation time to work at your convenience. Follow-up – We do our absolute best to perform your installation properly and accurately, but in the event that unforeseeable circumstances lead to issues, we’ll take care of it for you! Our job isn’t finished until you’re completely satisfied. To learn more about our selection on plantation shutters, our installation practices, or other window treatment related products and services, we can be contacted via email or in Dundee, FL at 863.617.7225 and in Lakeland, FL at 863.646.7500. You can also visit us at our store in Polk County to discuss your options in person.